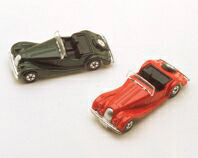 A collection of scale models of selected British Cars, recommended as a gift for any model car collector or enthusiast. 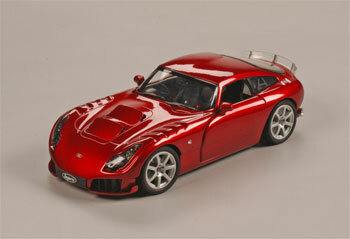 British and Beautiful TVR Sagaris is a 1:18 Scale Die Cast Replica by Revell�. Suitable for Ages 8 & Older. Opening air intakes on the bonnet. Exquisitely detailed right-hand drive interior including the dramatic shape of the seats, roll cage, and center console. Opening rear deck window with printed defroster lines. Vinyl tires with realistic tread pattern. Authentically reproduced 7 spoked wheels. Front spoiler with air inlets. Movable steering wheel and posable front wheels. Comes on a removable plastic base. The rugged bonnet pierced by air intakes, the distinctive front and the cockpit moved right to the back, give the TVR Sagaris its unmistakable dominant appearance, even at a standstill. Largely developed from the T350 Coup�, the Sagaris was specially developed for so-called endurance races, such as the famous 24-hour race at Le Mans. In order to satisfy the requirements for these races, the performance of its predecessor, which was already impressive, was racked up even further. The 3.6 litre engine accelerates the 400 bhp 1100 kg racer from 0 to 100 km/h in 3.6 seconds. In order to give the mighty six-cylinder engine the necessary power, numerous air intakes were integrated into the design of the bonnet - giving the Sagaris its most striking external feature. Other obvious attributes of its racing ambitions are the increased track width and the aerodynamic shape that gives it more stable road-holding. Features opening front bonnet and doors. 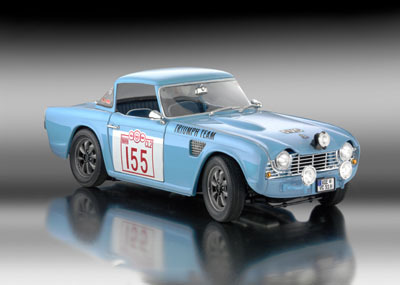 TR4 Rallye Car Hardtop are 1:18 Scale Die Cast Replica from Revell�. Suitable for Ages 8 & Older. This scale model diecast car (approx. 9" long) is very nicely done and we have priced them with our typical LBCarCo savings. Supplies are limited and once they are gone there will not be any more available. Superbly detailed, Powder Blue (Rallye Car) (Roadster) and British Racing Green (Roadster) diecast body with plastic parts. Wire Wheels (Roadster), Panasport Style (Rallye Car). Exquisitely detailed dashboard including readable gauges with chrome trim. Detailed black interior with red piping Roadster. Lift the hood to reveal the highly detailed engine. Chrome plated mirrors, window trim and wipers, bumpers, grille, and more! Presented on a removable plastic base. In 1962 the Standard Triumph company decided to promote sales of their cars by taking part in numerous international rallies. To do this four of the new Triumph TR4 model were used, after the extensive modifications that were needed in order to meet the difficult requirements of rallying. The TR4 was a successful rally car in its day, even though it failed to become an overall winner. The four cars used were right-hand drive to begin with and were given the designations 3VC, 4VC, 5VC and 6VC. In 1965 the 3VC, 5VC and 6VC were shipped over to the USA to take part in one last rally, the "Shell 4000" Trans-Canada. These three cars had been changed over to left-hand drive before they left so that they could later be sold in the USA. The TR4 5VC was the team car no. 1 and was piloted by the Swiss rally driver Jean-Jacques Thuner and his navigator John Gretener in no less than eleven international rallies. The team secured some 2nd and 3rd places, including second place in the 1963 Monte Carlo Rally. In the last rally representing the works, the Canadian Shell 4000, the co-pilot was Roy Fidler. The TR4 starting with number 155 ended the rally in 21st place overall and 2nd place in the team standings. Did you ever want to own a Morgan Plus 8? Well now you can for only $10.00! What a great deal and all your friends will be envious of you when you show them your brand new Morgan ;) These 1/57 Red or Green Tomy Diecasts are great little replicas of this powerful Classic. Order one today and add it to your collection! Make LBCarCo your first choice for diecast model cars and other British car items!